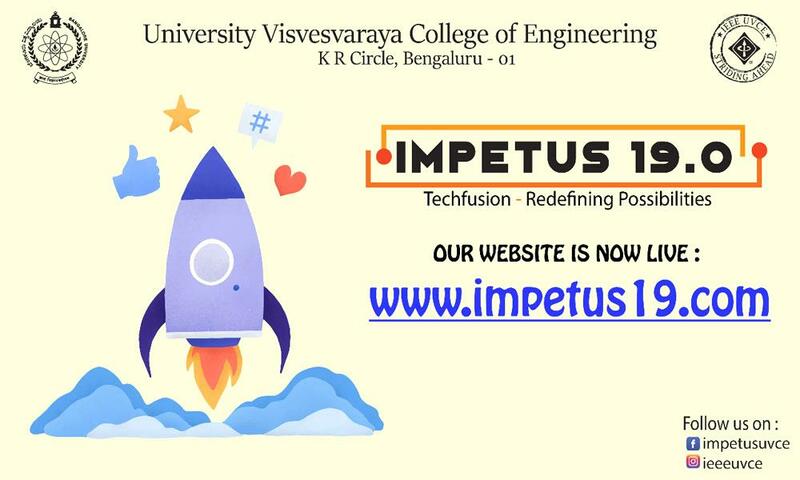 The 19th edition of the annual technical event, IMPETUS 19.0 will be held on 29th and 30th of March 2019 at UVCE College, Bangalore. IEEE UVCE is happy to announce their 19th edition annual technical event, IMPETUS 19.0, with the theme - "TECHFUSION: Redefining Possibilities". This event loaded with a number of flagship events, pre-fest workshops and tech-talks, Impetus is being conducted on 29th and 30th of March 2019 at UVCE College, Bangalore. This event is focused on Techfusion, which aims to explore the new arena of technical advancements to enhance our technical prowess. Techfusion involves the transformation of core technology through a combination process facilitated by technical advances. Don’t be strange, you can reach us at 9743569412 or write to us at soumyasraju98@gmail.com.